American military bases encircle the globe. More than two decades after the end of the Cold War, the United States still stations its troops at nearly a thousand locations in foreign lands. These bases are usually taken for granted or overlooked entirely, a little-noticed part of the Pentagon's vast operations. 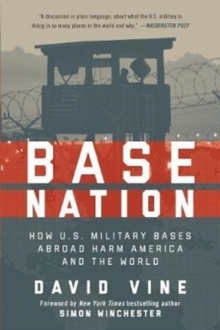 But in an eye-opening account, Base Nation shows that the worldwide network of bases brings with it a panoply of ills and actually makes the nation less safe in the long run. As David Vine demonstrates, the overseas bases raise geopolitical tensions and provoke widespread antipathy towards the United States. They also undermine American democratic ideals, pushing the United States into partnerships with dictators and perpetuating a system of second-class citizenship in territories such as Guam. They breed sexual violence, destroy the environment, and damage local economies. And their financial cost is staggering: though the Pentagon underplays the numbers, Vine's accounting proves that the bill approaches $100 billion per year. For many decades, the need for overseas bases has been a quasi-religious dictum of U.S. foreign policy. But in recent years, a bipartisan coalition has finally started to question this conventional wisdom. With the United States withdrawing from Afghanistan and ending thirteen years of war, there is no better time to re-examine the tenets of our military strategy. Base Nation is an essential contribution to that debate.